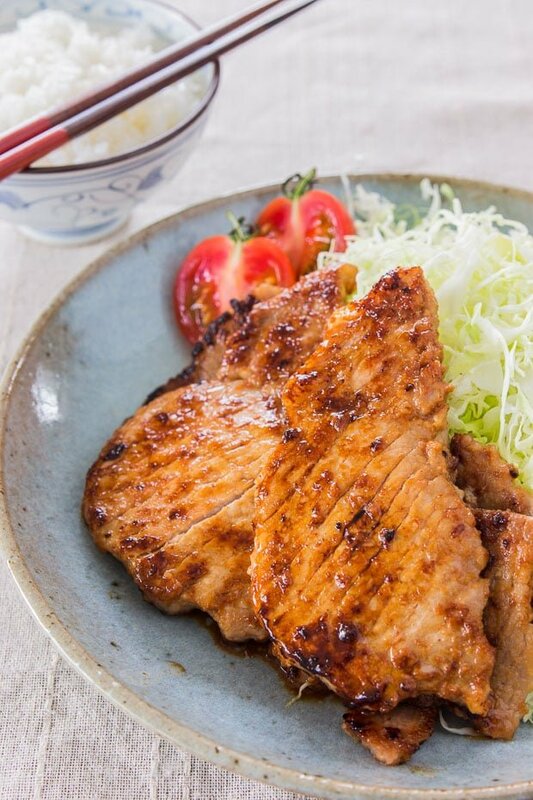 Shōgayaki (生姜焼き), a staple of Japanese home-cooking, is made by grilling pork chops marinated in a fragrant ginger miso sauce. With meetings in the city every day this week and a cold that doesn’t seem to get the clue, I haven’t exactly been looking forward to spending time in the kitchen. That’s why I have tried and true standbys like this Shōgayaki to get me through the week. Shōgayaki (生姜焼き), literally means “grilled with ginger” and is a super simple, fabulously flavorful way to prepare your favorite protein. In Japan, it’s usually made with thin pork chops (I’ve used both rib and shoulder chops), but this marinade will work equally well with lamb chops, chicken thighs or even tofu. Savory, aromatic, and pleasantly sweet, the marinade caramelizes around the outside of the meat, giving it a magical mahogany glaze that’s redolent of ginger and earthy miso. But this pairing is about more than just harmonious flavors. The enzymes in both miso and ginger help tenderize meat. 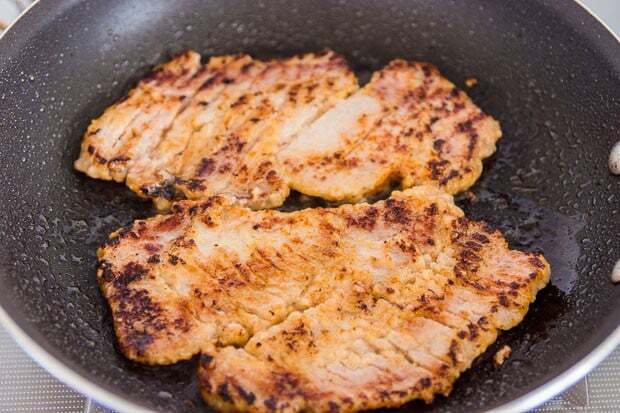 That’s why this ginger pork is ready to cook in minutes rather than hours. 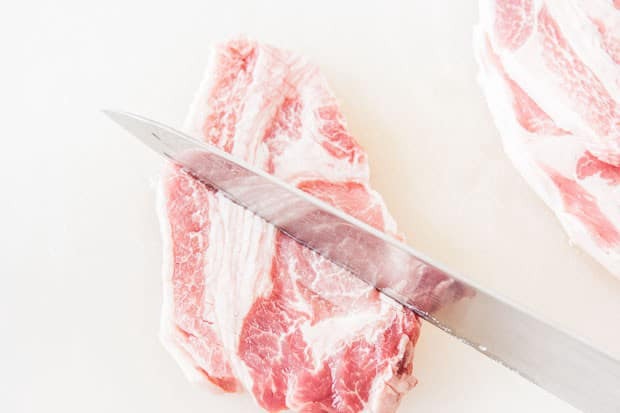 Because the pork chops are thin, it’s important to cut slits into the meat to break up the connective tissue, otherwise the chops will curl as they fry making it difficult to cook evenly. If you’re using chicken thighs, you can skip the slitting, but you’ll need to make sure it’s filleted to an even thickness so it cooks evenly. You’ll also want to start off with a cool pan , otherwise the marinade will burn before the chicken is cooked through. As for tofu, use a firm tofu and dry it thoroughly with paper towels before marinating it to keep the marinade from getting watery. Use a sharp knife to slice shallow slits about 1/4" apart in one direction all the way across one side of each piece of meat. Flip the cutlets over and make the same slits perpendicular to the directions of the slits on the first side. If you make the slits in the same direction you run the risk of cutting all the way through the meat. 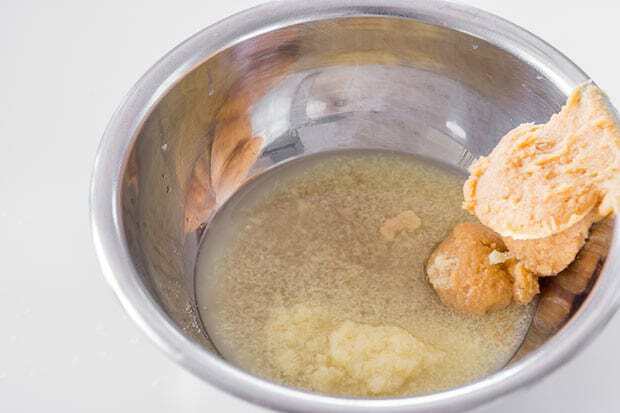 In a small bowl, whisk together the sake, miso, sugar and ginger to make the Shōgayaki sauce. Dip each piece of pork in the ginger miso marinade and place them on a tray. Pour any remaining marinade on top of the pork. Let this marinate as you prepare the rest of dinner. Five minutes should be plenty of time, but you can let it marinate overnight if you want. To fry simply heat a frying pan over medium-high heat until hot (but not smoking hot). 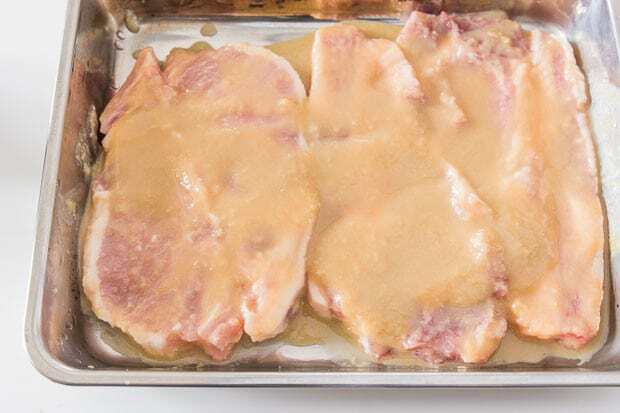 Lightly oil your pan (if you're using a lean piece of pork or other meat you may need a bit more oil) and add the marinated pork chops in a single layer. Brown on one side, flip and brown the other side. Because the sweet marinade will burn easily If the pork starts to burn before it's cooked through, turn down the heat. Serve your Shōgayaki with steamed veggies, or shredded cabbage and rice. That looks tasty! I like the use of the gochujang. Kurobuta pork is really the best…love the treatment here Marc. Perfect pairing of Japanese spices with this beautiful pork. This sounds – and looks – lovely. I’m really getting in to using miso in cooking – I want to throw it into everything, even western dishes. Thank you, Portugal! You’ve given Japan a great gift– they do spicy really well 🙂 I didn’t know gochujang’s also a popular ingredient in Japanese food– it looks and sounds perfect! Delicious! I’d have to scrounge around for Kurobata pork (not readily available in my usual haunts), but I love the spicing here. That pork looks and sounds absolutely stupendous. Of course, I can’t get any of these ingredients here in the back waters of Oklahoma. Oh my goodness, that pork is making me drool (both in cooked and raw form)! Looks amazing. i had kurobuta ramen a month ago..and the soup was just amazing. so rich and intense! this looks amazing and tht pork has a lovely colour. Wow – this is making me happy. I’m loving this pork and how it looks. I have a pork tenderloin in the freezer. I was gonna stuff it – but I think this would be waaaay more appropriate! I have a huge crush on Japanese food now and wanted to cook more Japanese classics. Your pork looks heavenly. Drool. I made this last night with thin slices of Berkshire pork. It was fabulous, and so easy. I’ve decided that this is now a regular dinner item. Picked up some thinly sliced Kurobuta pork at my local asian market just to make this dish. I followed the recipe almost exactly and it was so delicious! Thanks for all the good ideas. The flavor was great! I am thinking this would be a great marinade for grilling? Thank you for wonderful dinner. We all enjoyed it! I had to quadruple the quantity for three very hungry grown-ups, but it was super simple and all worth it! Next one up… pandan wrapped roast pork! thanks for this delicious recipe! i’ve been making it over the years and it’s a strike with the family everytime (: can’t wait to have it again tomorrow using pork chops instead! Nothing compares to the “bite” and flavor you get from fresh ginger (non-existent in ground). I have a question on how to best store it. I buy small amounts, enough for about 3 recipes, and then end up having to freeze it to keep it from molding. However, I have noticed that the frozen version ends up soggy (more difficult to grate on my ceramic ginger grater). How to remedy this problem or is it just something I will have to live with? I’ve seen ginger in a tube at the supermarket. Wow. A mouth-watering recipe. I like it how you tackled the steps one and clear at a time. Yum! This looks wonderful. I think I want to use it on some tempeh I have. Do you have any suggestions for cooking tempeh? Hi Channon, to be honest I’ve never been a big fan of tempeh as a meat substitute, so I haven’t worked with it much, but the times I’ve enjoyed it the most, it’s been fried until crisp around the edges. You could do something similar here, skipping the marination and then pan frying the tempeh before adding in the marinade and caramelizing around the outside of the tempeh. Can I use mirin instead of sake and just cut down on the sugar? Hi Isabel, you could probably replace all the sake with mirin and eliminate the sugar. But be sure you’re using real mirin as many “mirins” contain high fructose corn syrup. Thank you, Marc. I may just give the vodka solution a try. It seems to offer the longest storage period. Do you think I can bake this instead of frying? Also saw your “best pork chop” recipe and I was wondering if I can bake that as well… What temperature and for how long? Hi Marc, Yep that is exactly my concern…I just don’t want to add anymore oil. But you’re right… It should render out more oil so that works for me 🙂 I’m excited to try both both of the recipes! Thank you! you called. It wasn’t good at all. I just crave tempeh sometimes and enjoy using it on occasion, but this wasn’t “it”. i enjoyed this recipe, just wondering if their were any other recipes that are as good as this one, possibly one that implements tofu and soba. Thanks! Hi Nick, have a look through the site. You can also search for soba or tofu using the search box at the top. Hi Lindsey, I actually used both rib and shoulder chops. The shoulder is the one with more fat in it. It’s going to be a bit more tough, but but if you do the slits with the knife it should not be a problem and the meat is more flavorful.